Why Do We Need to Adjust Our Pump’s Nose Gap? Should be close to zero in operations without touching. Operating conditions such as hydraulic axial force, shaft deflection, and thermal expansion require a minimum initial clearance. Routine adjustment will compensate for normal wet-end component wear. Q: Our pump is running fine. Why did our GIW representative tell us we need to adjust our pump’s nose gap? A: The three main wear parts of a slurry pump are the suction liner, the impeller, and the shell or casing. 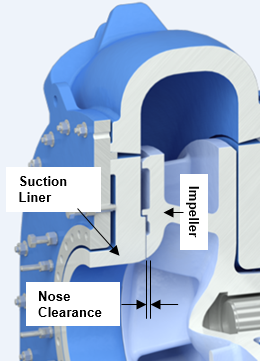 The nose gap on a centrifugal pump is the distance between the suction liner and the impeller. When you operate a centrifugal pump, the nose gap affects the pump performance and, more importantly, the wear of those parts. With the right clearance, the gap is very small, creating high pressure at the outside of the impeller and low pressure at the eye of the impeller. If you open up that gap, particles try to move from the high-pressure location to the low-pressure location, and they recirculate around the impeller suction shroud, causing faster wear rates on the impeller and the suction liner. Double or triple your pump’s wear life: Mind the gap! During pump operation, the nose gap will gradually increase, so GIW recommends adjusting the nose gap frequently — once a week is ideal. When the nose gap is properly adjusted, the impeller will be as close as it can be to the suction liner without touching it. The setting for that distance is different for each pump model and is influenced by design and operating factors. Adjusting the gap is simple. The whole bearing assembly can move back and forward. An adjusting screw and nut are located on the back of the bearing assembly. Loosen the hold-down bolts on the bearing assembly and use the adjusting screw and nut to move the bearing assembly forward until it touches the suction liner. Then back it off, leaving the distance prescribed for your pump. Proper nose-gap set distance is listed in the maintenance manual for every GIW pump. In addition to weekly maintenance, be sure to reset the nose gap when performing pump repairs or replacing parts. It’s such a little thing, but maintaining the nose gap can double or triple the wear life of your parts! Do You Have a Pump or System Question?